I am, admittedly, a burrito addict. My favorite burrito on earth is from Cabo Bob's in Austin. Obsessed. They have handmade tortillas cooked right in front of you, natural meats, vegetarian/vegan friendly options, organic brown rice, and a chipotle crema that is to die for. But since I rarely get my fix of CB's, I decided to recreate a burrito bowl at home. I don't know if any Chipotle addicts are reading this, but if you are, here's a much healthier substitution! If you must eat there, here are some guidelines to help you keep it lean. Add lettuce to the bottom of a medium bowl. Top with rice and beans, warmed or cold. 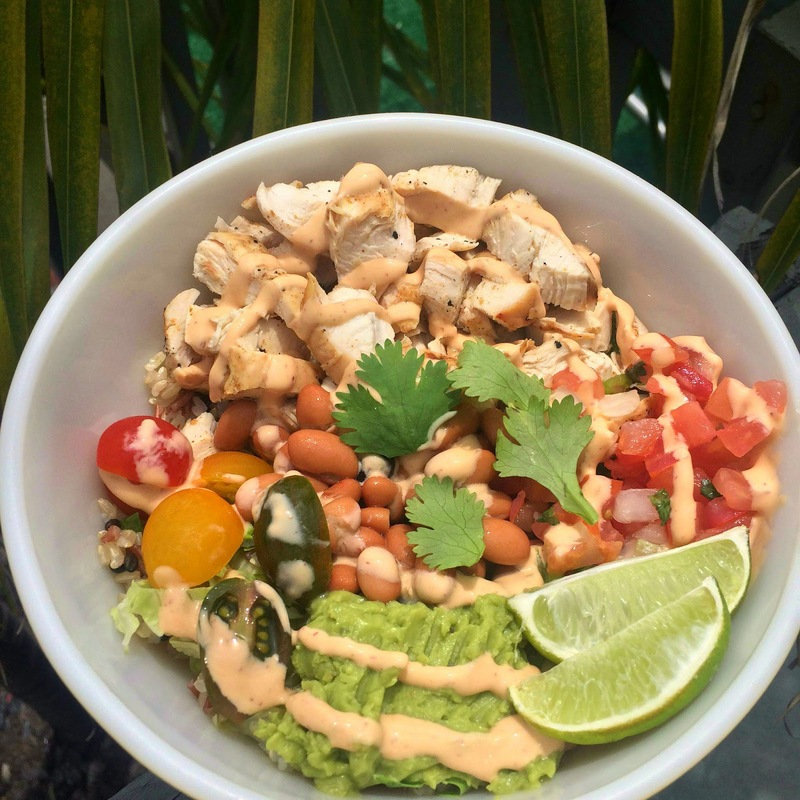 Add diced chicken, guacamole, tomatoes, and any other toppings to the bowl. Drizzle with chipotle Greek yogurt crema. In a food processor or blender, add all ingredients, starting with 1 tbsp of milk. I like to put mine in a squeeze bottle and have a thinner consistency of the sauce. If you like thicker sauce, use less milk. For thinner, add more. Also, sometimes the chipotles stop up the squeeze bottle, so make sure to blend well. **The crema should keep for about 1 week. I like to use on fish tacos, eggs, and salads for a little extra zing. I'm not quite sure why but my original comment did not go through! This recipe looks fabulous! Especially the Chipotle Crema! So bummed I couldn't make the last meeting but hopefully I will be able to make one soon!